Toyota Motor Corp and BMW AG will jointly research a lithium-air battery expected to be more powerful than the lithium-ion batteries used in many hybrid and electric vehicles, the two firms said. Toyota uses lithium-ion batteries in its Prius plug-in hybrid, some Prius v, and the eQ electric car. A lithium-air battery has its anode filled with lithium, and cathode with air. Theoretically, the battery can store more than 5,000 watt-hours per kilogram. (A123 M1 cells are around 120 wh/kg). The technology is being studied by researchers including IBM , which is working to develop a lithium-air battery that will let electric vehicles run 500 miles on one charge. Toyota and BMW also said they would work on a shared platform and technology for a mid-sized sports car, and develop technologies to make cars lighter and thus more fuel-efficient. 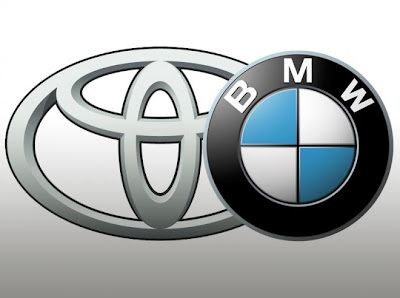 Eager to strengthen its diesel engine line-up in a sagging European market, Toyota agreed in 2011 to collaborate with BMW on lithium-ion battery research in exchange for a steady supply of BMW-made diesel engines starting in 2014. BMW, which needs to cut carbon emissions of its new car fleet by roughly a third by 2020, agreed with Toyota in 2012 to work on fuel cells and electrified powertrains too. Toyota's Uchiyamada said they wanted to decide as soon as possible on how to collaborate on the electrified powertrains.